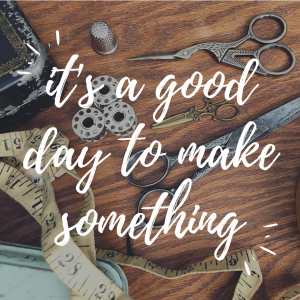 I was so excited to get the nursery ready for my first little angel that I raced to the land of fabric and purchased a number of adorable sheeting prints and a pattern for crib sheets. I merrily went on my crafty way cutting, pinning, elastic-ing and sewing until I had half a dozen complete. 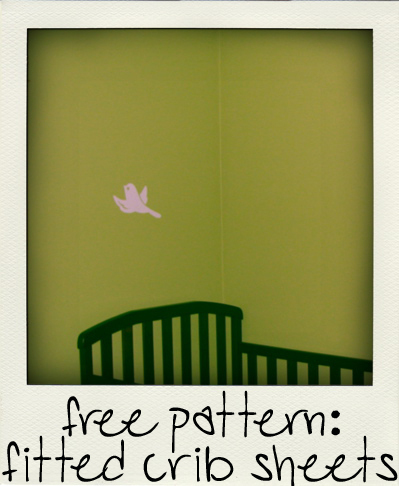 I hurried to the nursery to adorn our bundle-to-be’s bed with pretty pastel polka-dots and posies but to my dismay…. My ‘standard’ crib sheet pattern wasn’t so standard at all! And what was worse was that my six pack of sheets were too small! Disheartened and a bit irritated, I stuffed my proportionally challenged bedding into my ‘scrap’ basket and resorted to purchasing appropriately sized sheeting. Well I’m expecting my second child any day now and this time it’s different. This time I got it right. 1. Layout your fabric on a flat surface, right side up. 2. Cut 7” squares out of each corner. 3. Bring cut edges together for each corner with right sides facing. Pin and sew with 5/8″ seam. 4. To form casing for elastic, press ¼” along the end and down each side of your sheet bout 8″. Press edge in another ¼” and sew close to pressed edge. Repeat at other end. 5. Feed elastic through casing, tacking at one edge. Pull elastic to desired fullness and tack at other end of casing. Cut off excess elastic. Repeat at other end. 6. Press ¼” + ¼” on remaining sides and sew. 7. Try it on your crib mattress, stand back and appreciate all your hard work. You did it! If you have a different size or thickness of mattress you can use the following guide to create you own custom pattern! Take the height of your mattress and add 2”. Take the length of your matress and add two times the length of your corner square. Take the width of your matress and add two times the length of your corner square. This entry was posted in baby stuff, free patterns, sewing and tagged baby, free pattern, sewing. Bookmark the permalink. I made my first crib sheet last night and it turned out great! My mattress was 6″ deep so I used your guidelines to create my own measurements and the sheet fit like a glove! So glad it worked out. I was going to suggest making the pockets/sides deeper…mine just fits. Love your pattern. I had a pattern and lost it so this was great. One question. What is a French seam? Is it like a flat-felt seam? Hi Sherry, I don’t actually know, off to google it! I believe to sew a french seam you start with the wrong sides of your fabric together and stitch a narrow seam. Trim edges and now turn with right sides now facing. Stitch another seam wider than your first so that you encase your raw edges. You are left with a seam with no raw edges. You can press this to one side and top stitch if you’d like. I want to make changing pad sheets. 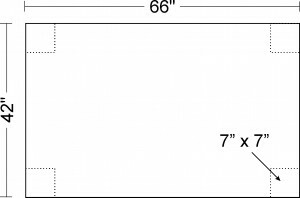 How do I reduce the formula to make a sheet for a changing pad 33″L x 16″W and a 4″ corner? Thank you for any help you can offer and have a blessed day. You would start with a rectangle 45″ x 28″ and cut 6″ corner squares. Good luck! Thank you for the tutorial. I used it to make a fitted sheets for my camping mats. The guidelines were great for getting the right fit. I used microfiber and attached my elastic to the raw edge with a three step zig zag. Quick and easy. Attaching elastic with zig zag is an excellent upgrade on the pattern Amy. Great idea! I bet your cap mat covers fit like a dream. I try to make all the kids crib sheets. I use to have a pattern but my older children destroyed it. My oldest now sleeps in a twin bed and we don’t use the flat sheet. So I will be using it to make the sheets for the cribs. Thank you for the pattern. I love the idea of using unused twin flat sheets to make crib fitted sheets. I’m sure I have a few in my closet that I can convert! Hi, I am sewing twin fitted sheets. I want to put elastic all the way around. Is there a formula or ratio for calculating how much elastic to put into my casing? Since different brands of elastic would have different stretches I would recommend making the casing all around your sheet, leaving a couple inches open. Thread your elastic through the opening and pull both ends until the corners pull in nicely. Sew the ends of the elastic together and then stitch up your opening. Voila! As a starting point, use the same length of elastic as the perimeter of your mattress. A standard twin in 39″x75″ so you would need 228″ or 6-1/4 yards of elastic. I would also recommend making your pockets deeper than for a crib sheet. Instead of adding 2″ to your mattress depth, add 4″. This will help keep the sheet on your mattress better. Has anybody used the fold over elastic? I was thinking it would be a nice finish and maybe eliminate a couple of steps. I haven’t heard that anyone has tried fold over elastic yet but I’d love to see your finished product. Sounds like a great improvement on the pattern and would definitely reduce a step or two. Good luck! I’m going to try to make a cover for my labrador’s bed. Hers is worn out.